We departed our hotel at 545am to drive the shirt distance to the seventh wonder of the world The Taj Mahal. Security is now tight since my last visit and no motorised vehicles are allowed inside and not allowed within a radius of 5 klms due to the heavy pollution than sits as a heavy blanket over Agra. Once inside you are struck by the grandeur of this magnificent monument for all seasons, with its translucent marble and channeled gardens, the gateway of the mausoleum this is truly a masterpiece in its own right. At dawn the colour changes from white to silver rose pink, the marble arches provides visitors with the perfect frame for their first view of the ensemble. Although you are surrounded by many visitors, you still have the sense of being alone as you gaze in awe at this spectacular monument. 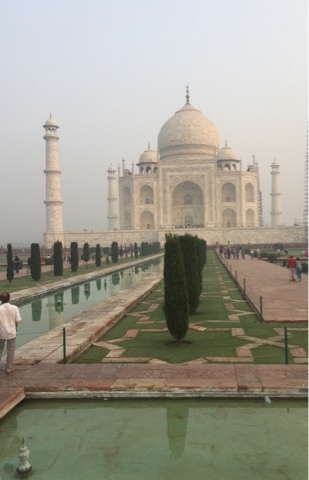 After taking several pictures, our guide waited patiently to explain the history of the Taj. 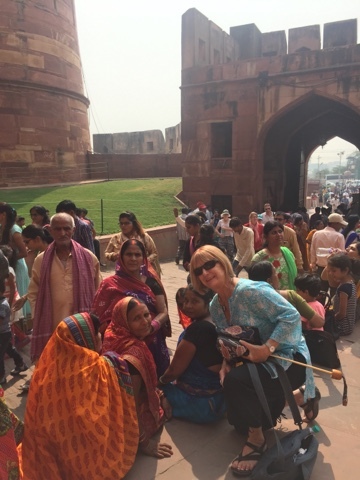 We returned to our hotel for late breakfast and a refresh before continuing our sightseeing tour and a visit to the Agra Fort built in 1565. Entering by the south gate takes you up to a ridged elephant ramp, slopped to slow down potential attackers. The Palace of Jahanjir is built around a square court with arches with Hindu motives on the ceiling, and peacocks holding snakes in their beaks. The outstanding architecture. Is quite different to Fatiphur Sikri or Delhi's Red Fort. 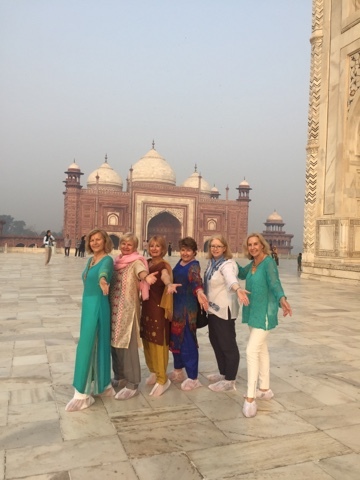 Later we had time to spend our last few rupees before returning to our hotel for a swim and relax, before returning to the Taj Mahal for our 2nd visit this time from the backside to view a magnificent sunset which changes the colour of the marble to a brilliant gold. In the evening we celebrated a farewell dinner at our hotel. It will be sad to say goodbye to the group as we all go in seperate directions.